If you want to go whale watching among the San Juan Islands as a day trip from elsewhere in the Puget Sound region, look for an operator departing from the city or town you will be visiting. Those ports are listed alphabetically below. On the other hand, if you are staying overnight on one of the Islands, you may want to use a local charter or outfitter. Also, some operators have departures from both the islands and the mainland. In addition to whale watching opportunities, each of these ports offer a variety of accommodations from bed and breakfast lodging to hotels and motels should you wish to make an overnight trip and enjoy your whale watching outing at a more leisurely pace. To learn more about each port, just click on the city name. Island Adventures welcomes you to an outstanding whale watching experience! Anacortes is the ideal departure point as there is no need to hassle with the ferry! On our 5-6 hour GUARANTEED whale watching tours you have to opportunity to see a variety of wildlife. You can expect many including a full time naturalist on every trip, free binocular use, a 64 page wildlife viewing guide, on board food service, two spacious bathrooms, full walk around viewing decks, and a large indoor heated cabin. 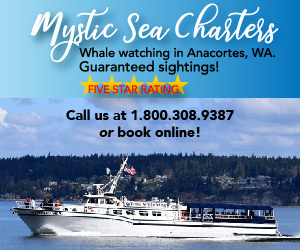 This tour was voted the #1 whale watching tour in western Washington three years in a row! San Juan Island Shuttle Express. 355 Harris Avenue, #105, Bellingham, WA, 98225. Phone: 360-671-1137.